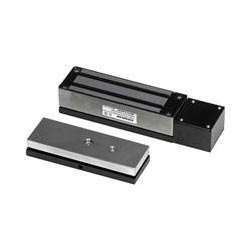 The Seco-Larm E-942FC-1K3SQ electromagnetic gate lock with weldable armature and magnet brackets is designed to prevent unauthorized visitors from gaining entry to your home or business. This electromagnetic lock (mag-lock) was designed for outdoor use to keep sliding and swinging electric gates securely closed. It has 1,200 pounds of holding force, when power is applied to the magnetic lock it turns on the unit's powerful built-in electromagnet. The lock can be triggered by a security system, relay switch, or even with a standalone RF transmitter and receiver system.